^ Efter 2003, no ceety wis the offeecial caipital, but legislative an executive institutions remained locatit in Belgrade. Podgorica served as the seat o the Supreme Coort. ^ Membership as the Federal Republic o Yugoslavie; ISO 3166-1 = CS; UTC offset = +1. ^ De facto currencies uised in Montenegro an Kosovo. Serbie an Montenegro (Serbie: Srbija i Crna Gora, Србија и Црна Гора; SCG, СЦГ), offeecially the State Union o Serbie an Montenegro (Državna Zajednica Srbija i Crna Gora, Државна Заједница Србија и Црна Гора), wis a kintra in Sootheast Europe, creatit frae the twa remainin republics o Yugoslavie efter its breakup in 1991. ↑ Price, Matthew (5 June 2006). 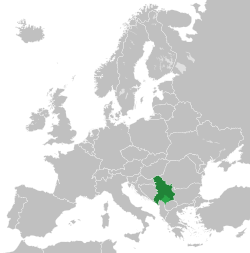 "Profile: Serbia and Montenegro". BBC News.